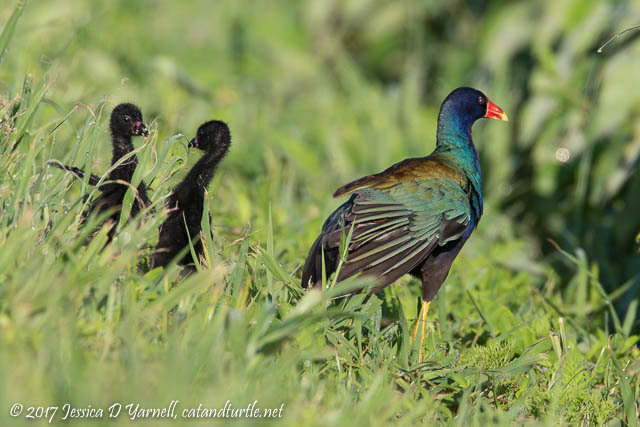 On my previous visit to the Lake Apopka Wildlife Drive, I found a small family of Purple Gallinules with tiny babies. They were very curious, friendly little things – and then a car went by and scared them off. My best shot was a fuzzy black bottom disappearing into the bushes. So of course I had to go back to get better photos! 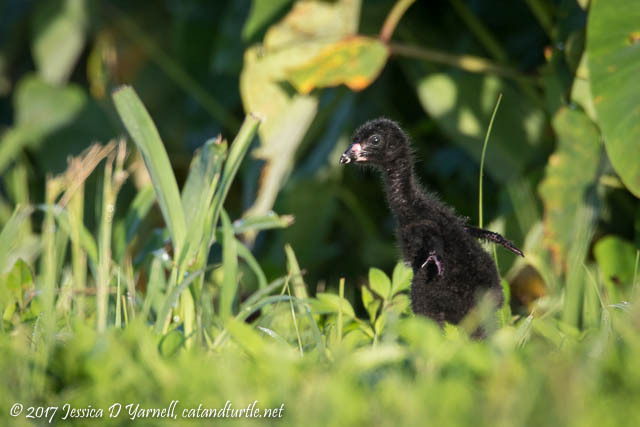 Baby Purple Gallinules don’t look all that different than their Common Gallinule “alien” cousins. They are both black with those tiny stub winglets. The Purple babies have an orange beak with black stripes. Nature never ceases to amaze me with the colorful variety of bird babies! I counted at least three, probably four babies. Mom and Dad were very protective. They kept the babies sheltered in the grass, away from cars. They only poked their heads up to pose for photos a couple of times. This last time made me chuckle. Mom was walking around looking for breakfast and preening her feathers, and the babies seemed to get bored. So they started tussling like baby Sandhill Cranes! One ended up rolling down the slope! 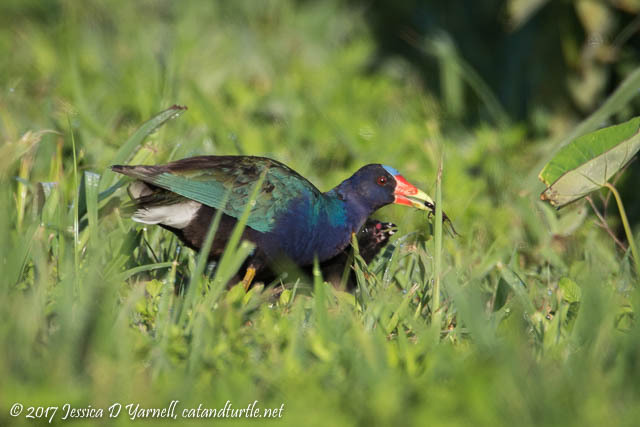 A biker went by and scared the Purple Gallinules off, so I continued along the drive. 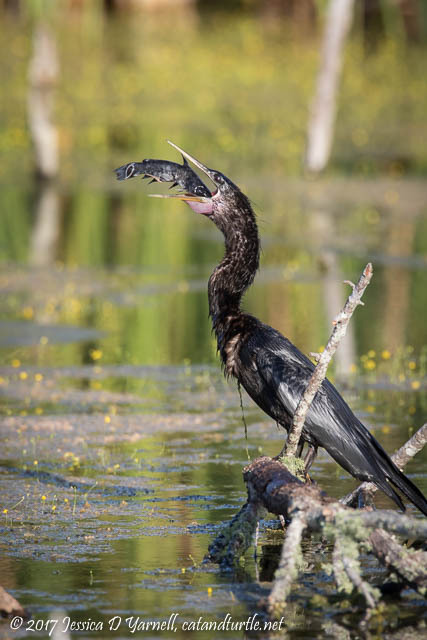 My next photo op was an Anhinga enjoying breakfast. He had a huge fish and he kept tossing it and turning it, getting it angled just right for the final gulp. 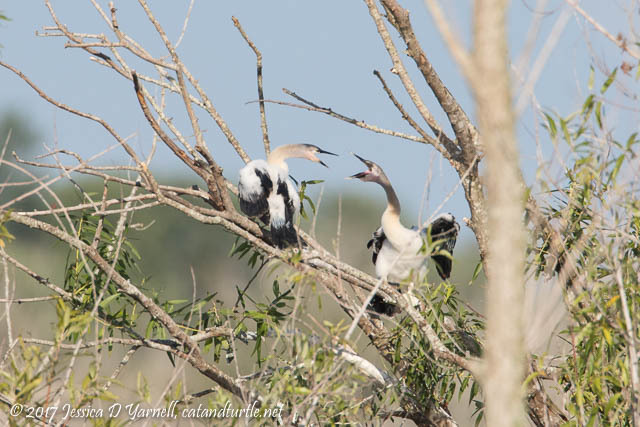 I heard the calls of juvenile Anhingas, and found these white-feathered juveniles branching in a far-off tree. Both were hungry. Each seemed to think that the other was going to regurgitate breakfast, just like Mom does! With all the rain we’ve been having, the vegetation is filling in, and it’s getting harder to find bird nests. 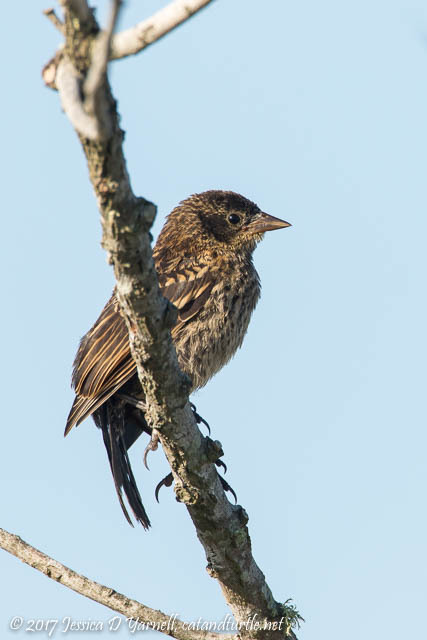 But there is a still a ton of nesting activity with fledglings hopping out all over the place! 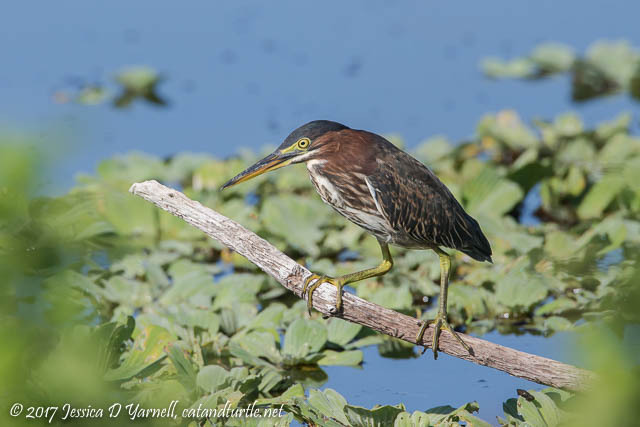 This Green Heron was very photogenic as he perched out on a snag. He spent most of his time concentrated on the water, waiting for breakfast. But before he got to dine, he was scared away by a passing car…yeah, it was one of those days at the drive! I didn’t see Forky at the sod fields, but I didn’t spend much time looking, either. I had to get home. But it’s always good to get out to Lake Apopka, even if you can’t stay as long as you’d like. 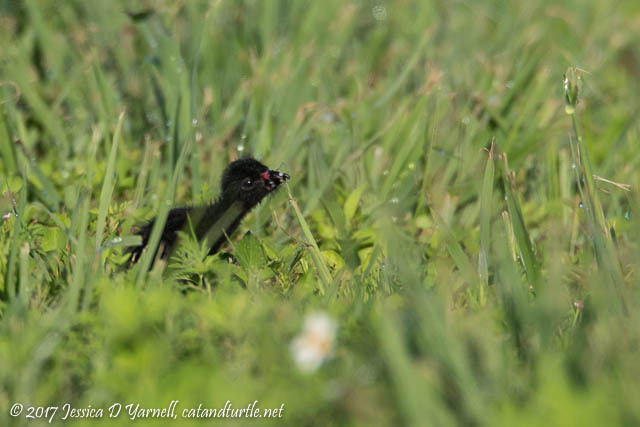 One More Baby Purple Gallinule – So Cute! !